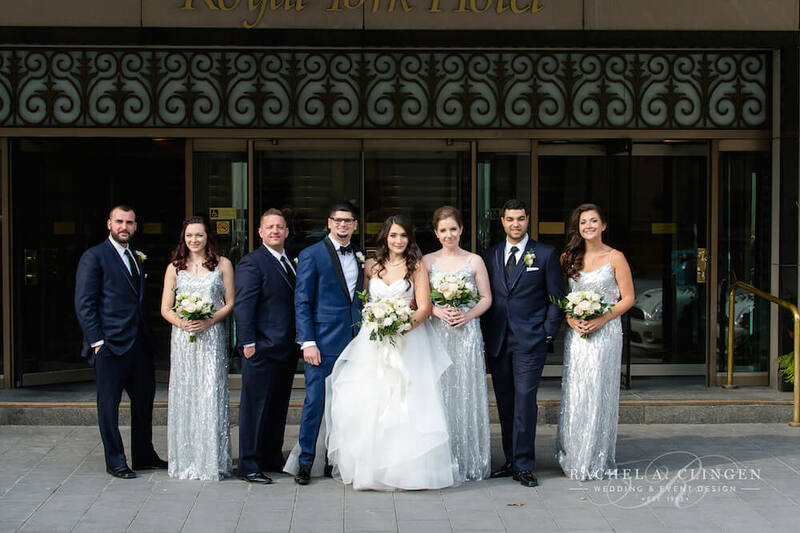 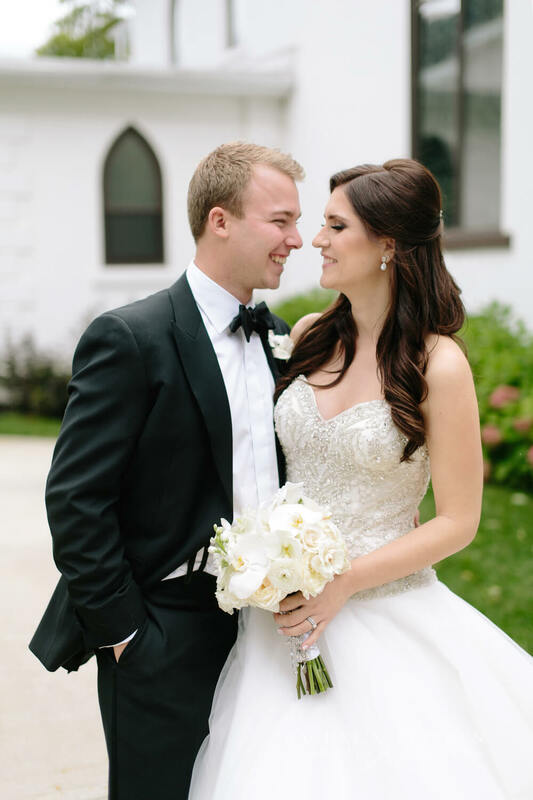 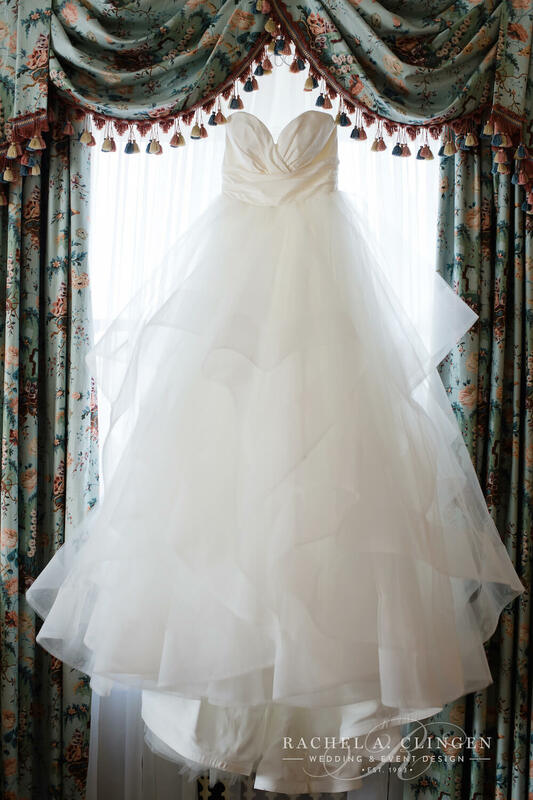 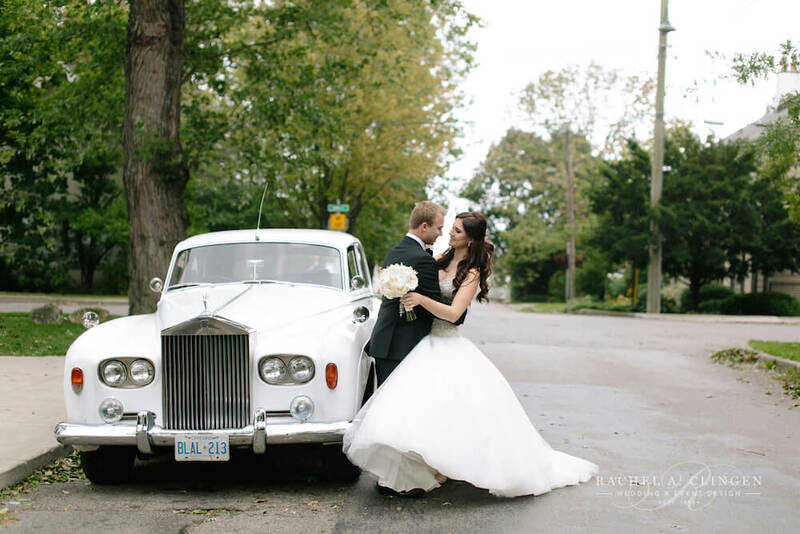 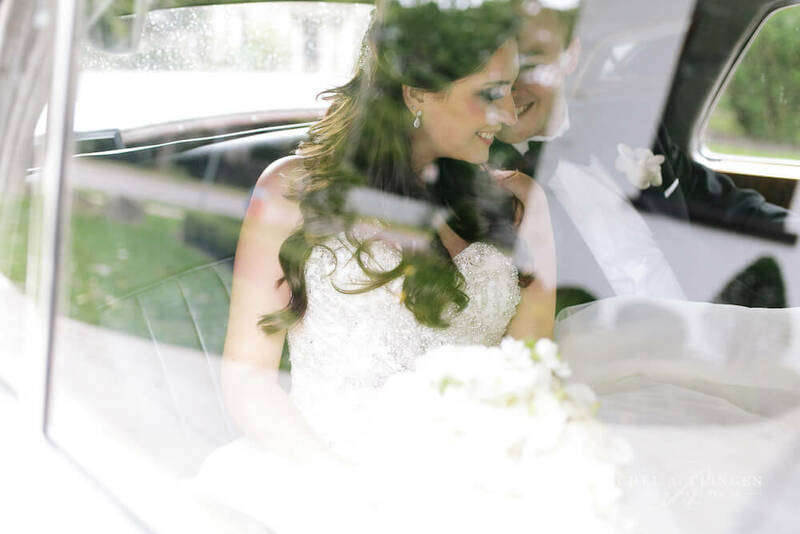 It was a beautiful fall day for Alexa and Jon Micheal’s elegant Royal York Hotel Wedding in Toronto. 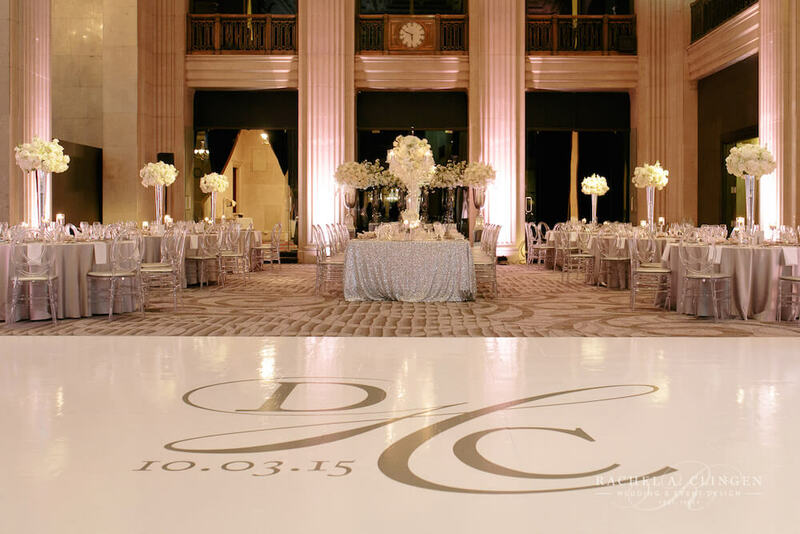 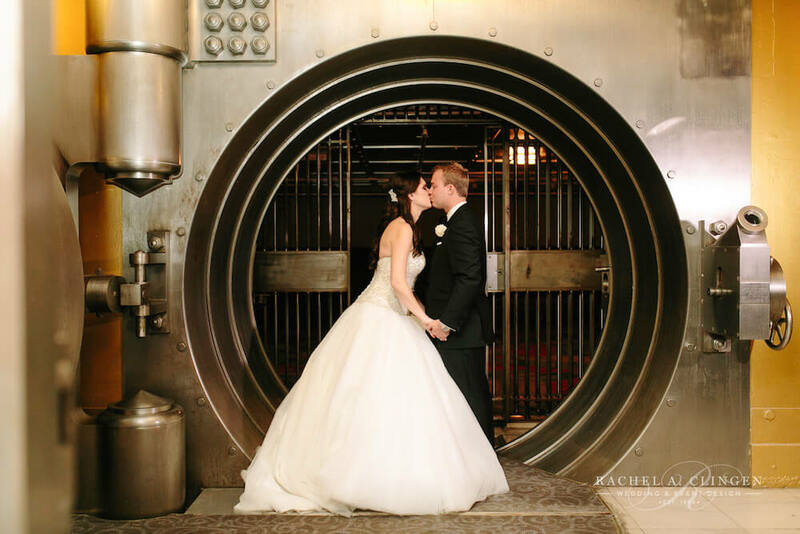 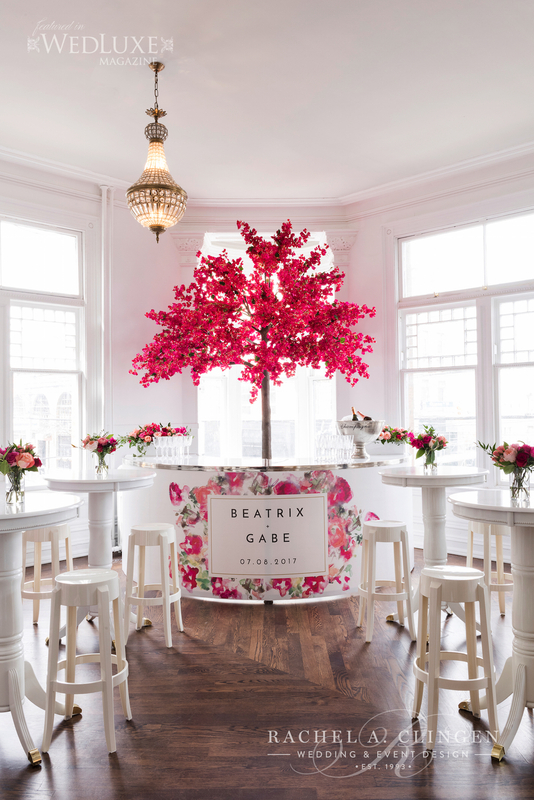 The decor and flowers were designed to accent the existing beauty of this historical Toronto gem. 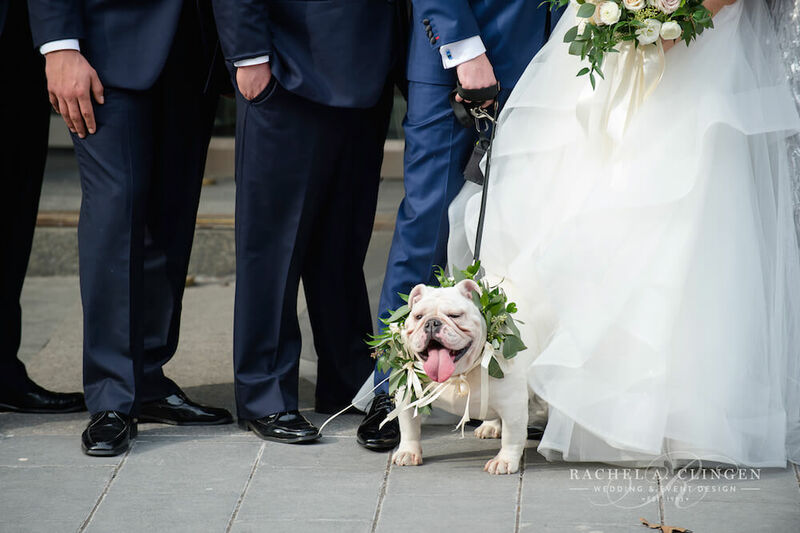 No detail was overlooked and even the couples little pooch had an adorable floral wreath. 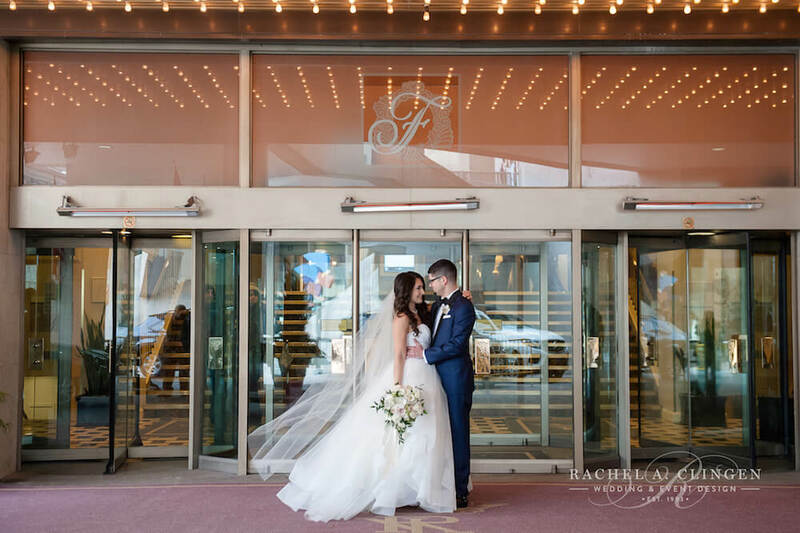 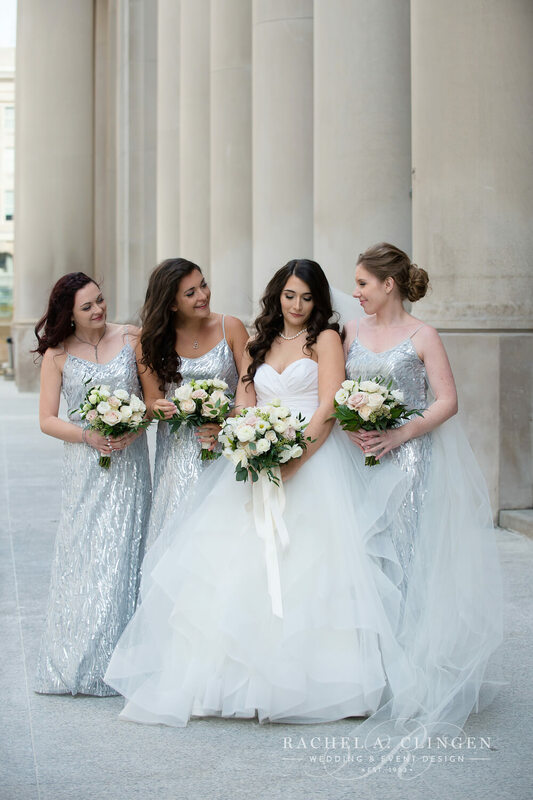 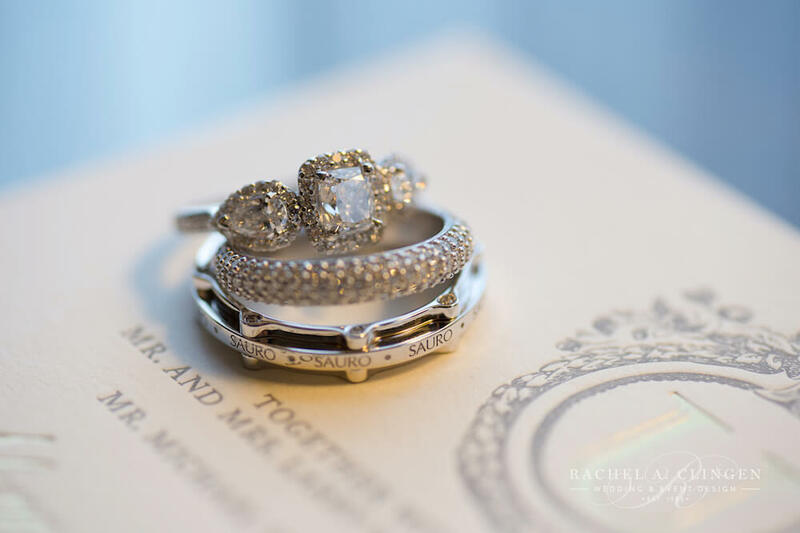 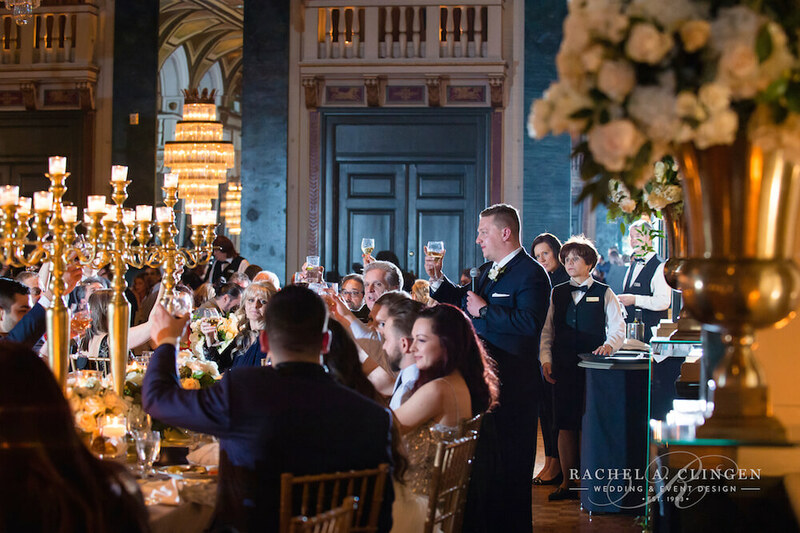 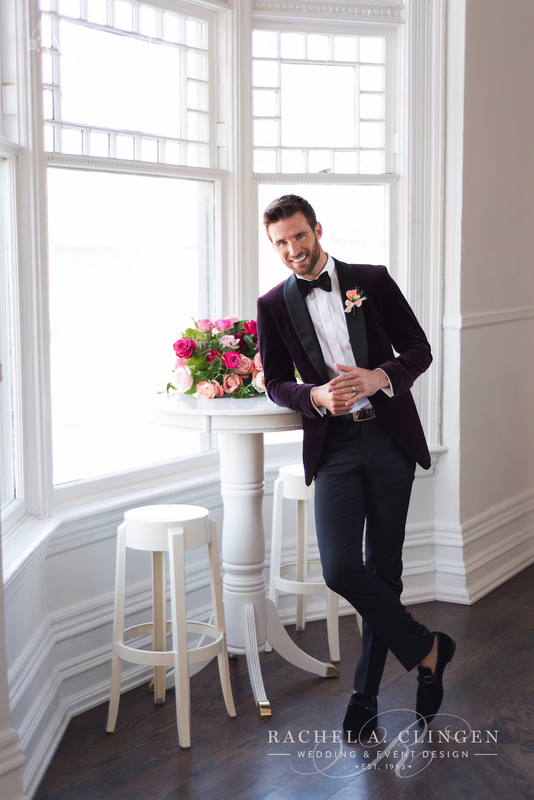 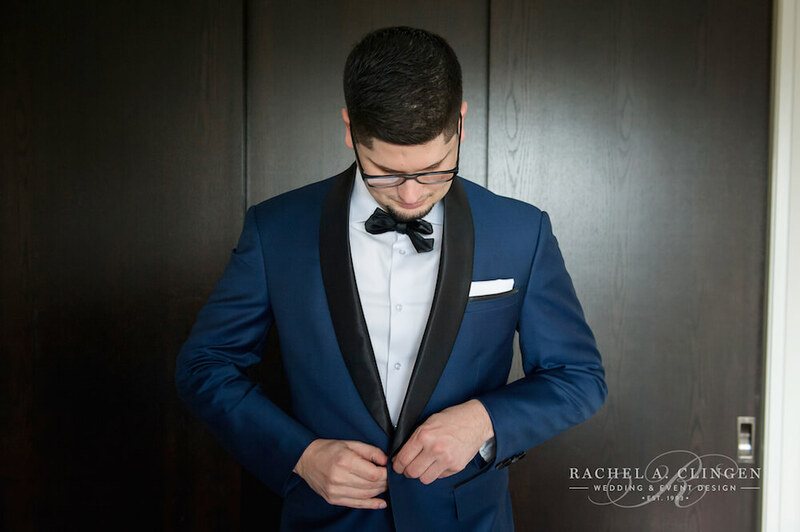 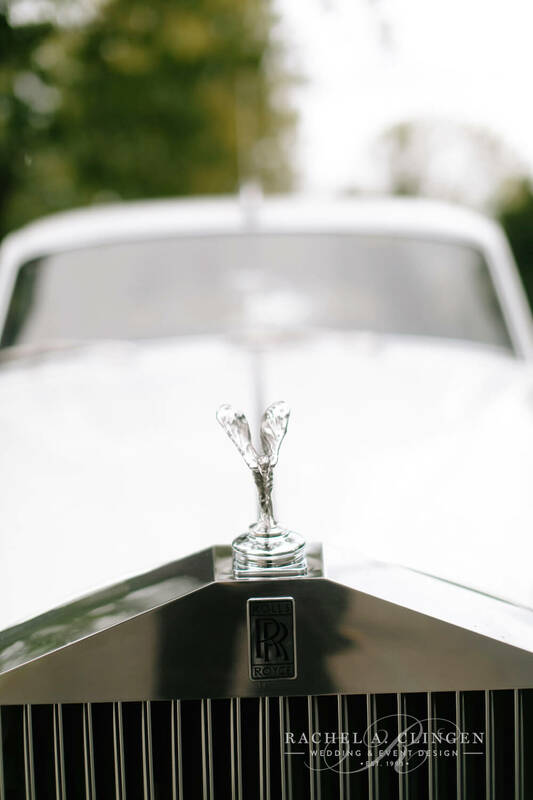 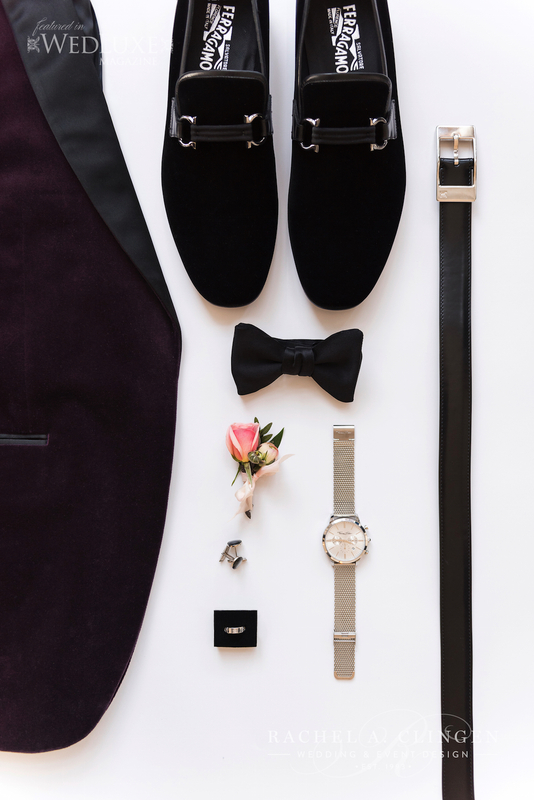 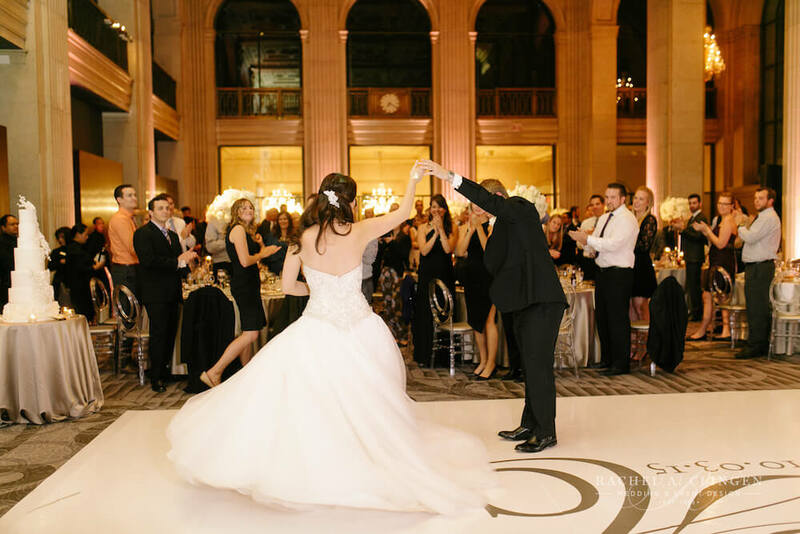 Sometimes our down town Toronto weddings have an urban or modern vibe, however Jon Michael and Alexa, wanted to embrace the romantic nostalgia of the iconic Royal York. 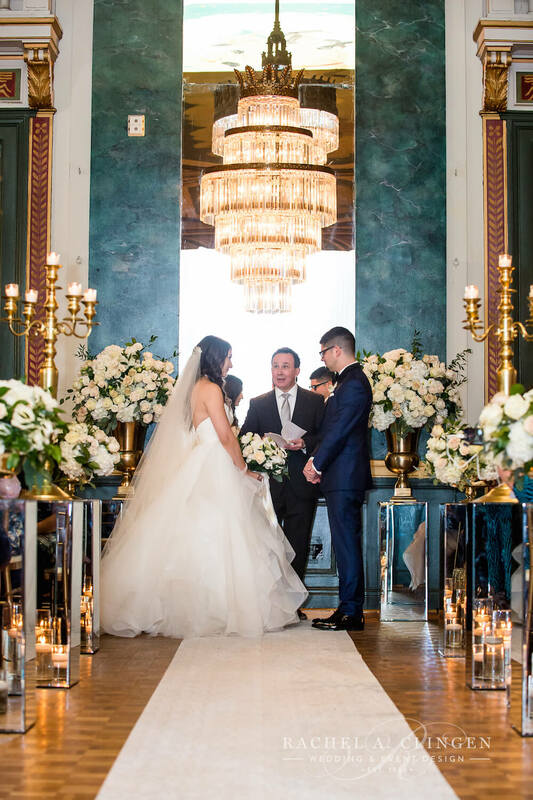 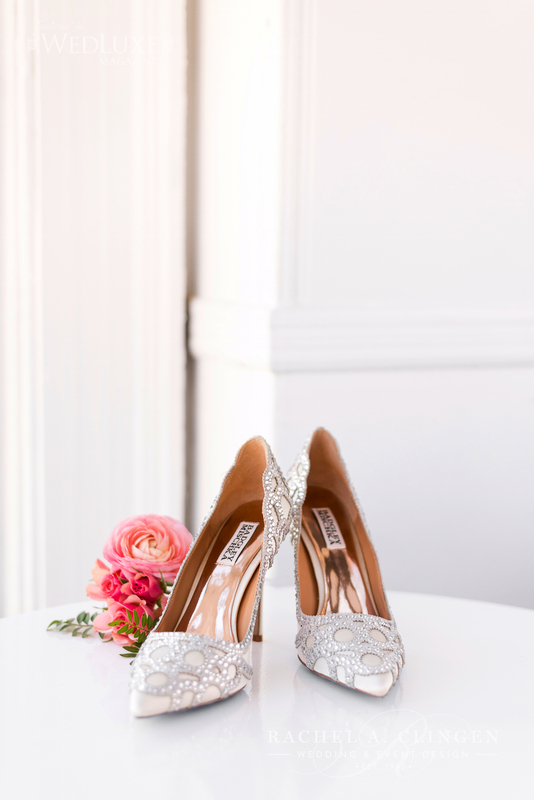 We did this with classic ivory and blush flowers on our sleek mirrored stands which lined the aisle for the ceremony. 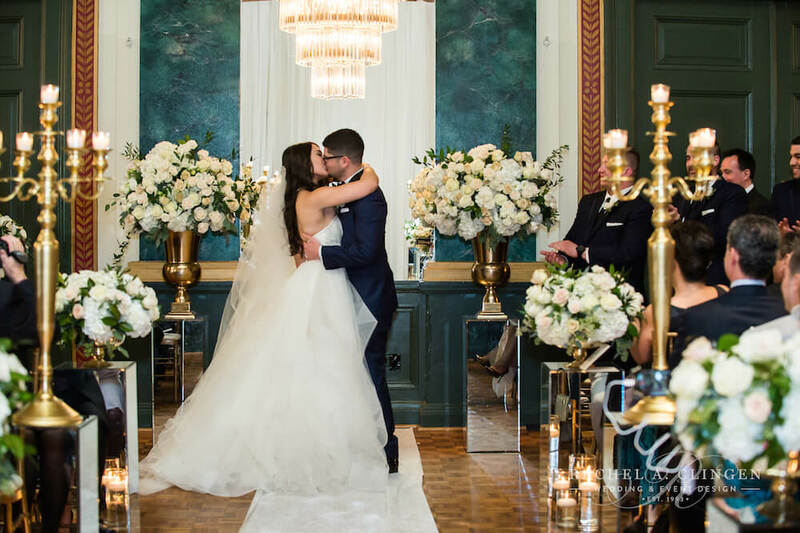 In addition, two over sized gold urns filled with roses, hydrangeas, and foliage created a beautiful focal point and alter area for the couple to say their ‘Ido’s’. 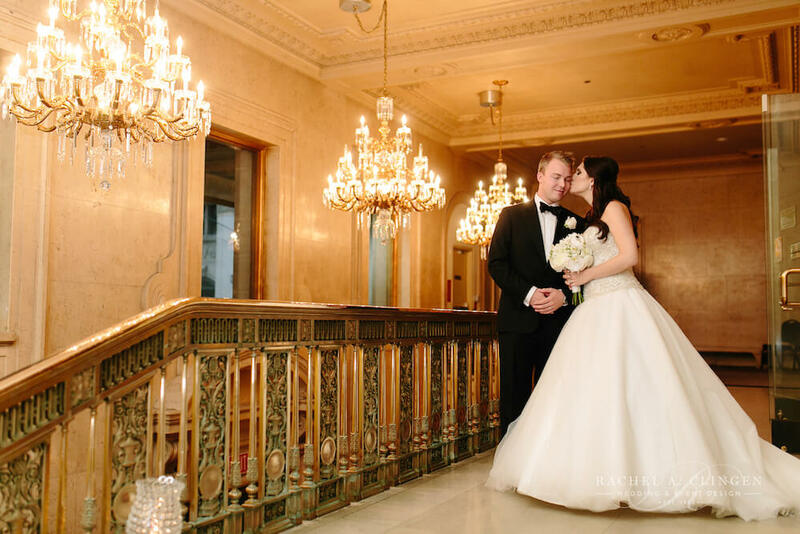 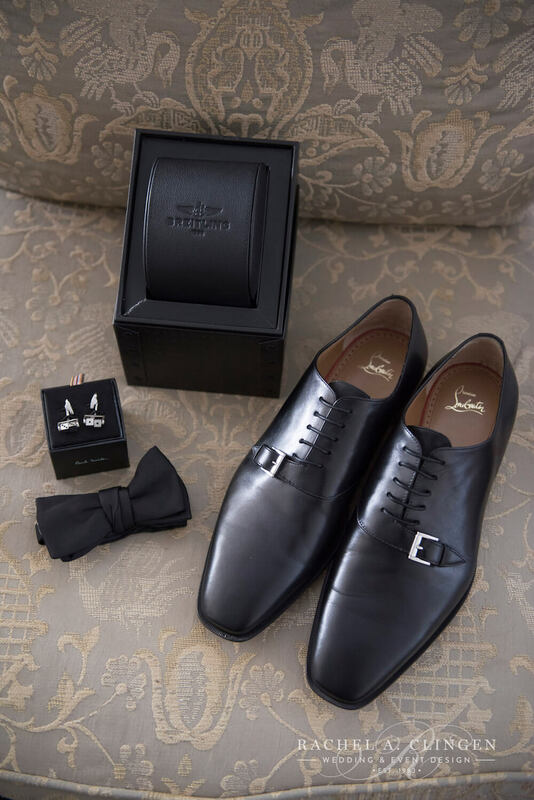 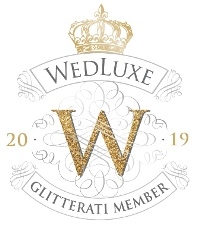 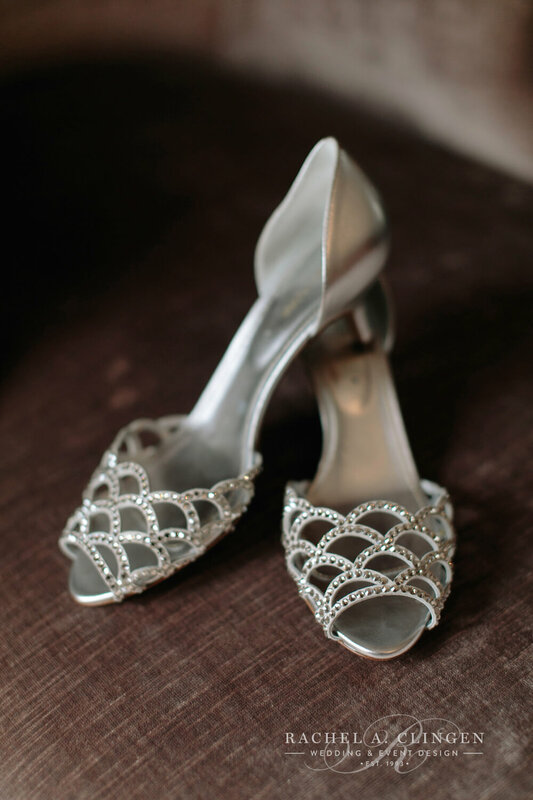 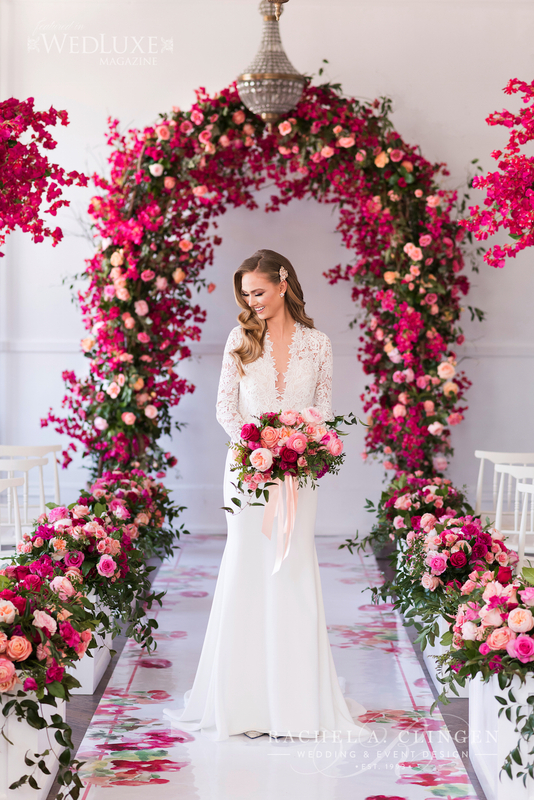 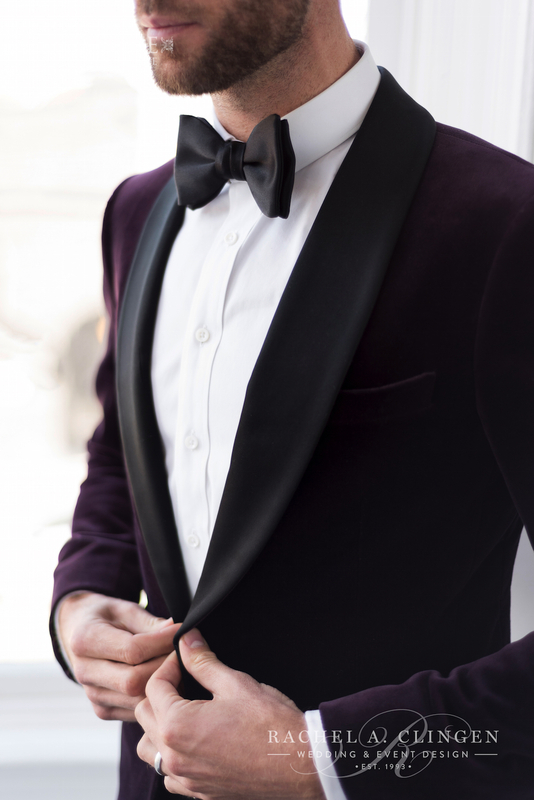 Finally, thank you to Wedluxe Magazine for featuring this elegant Royal York Hotel wedding on their blog and to Found In Love for the stunning images. 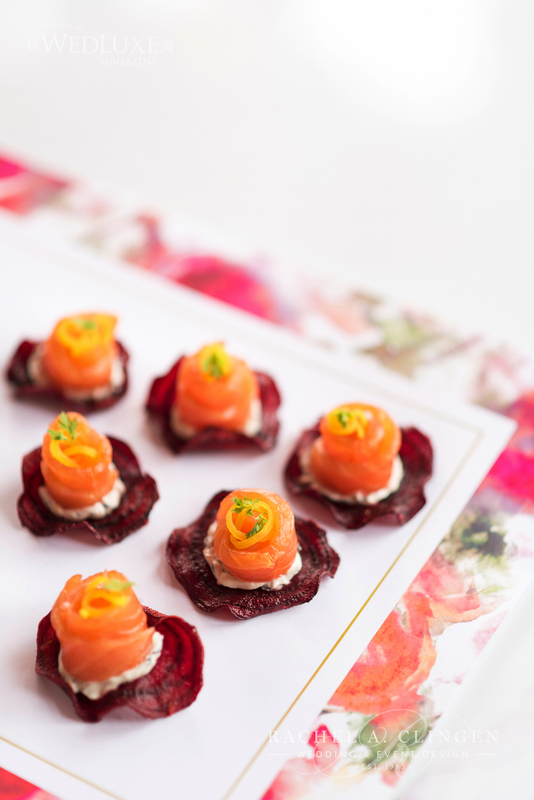 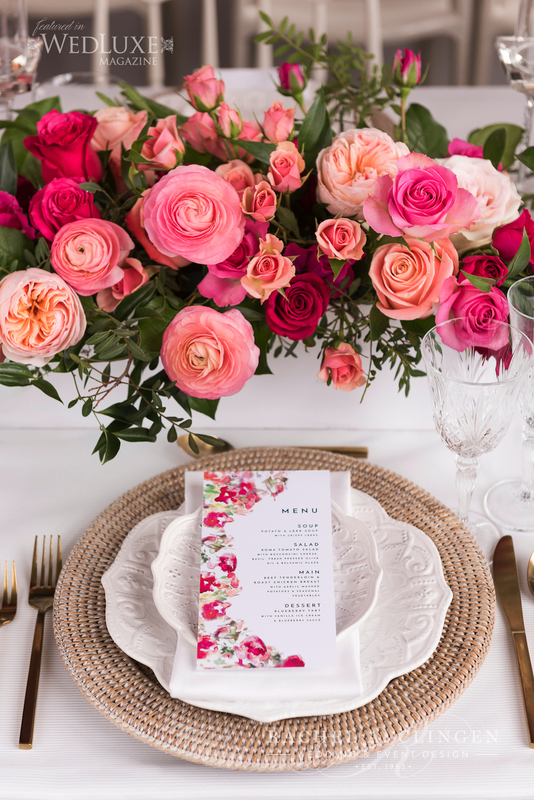 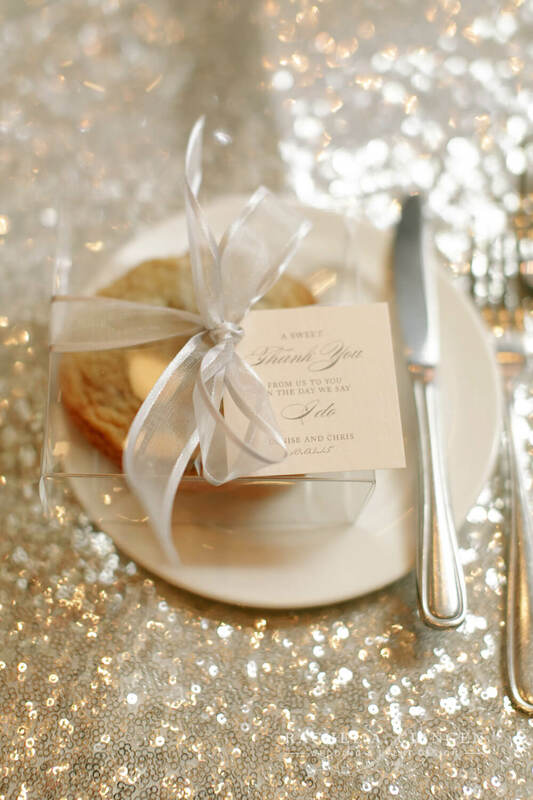 Also, as always, it is such a pleasure to work with our sweet friends at Laura & Co. Events. 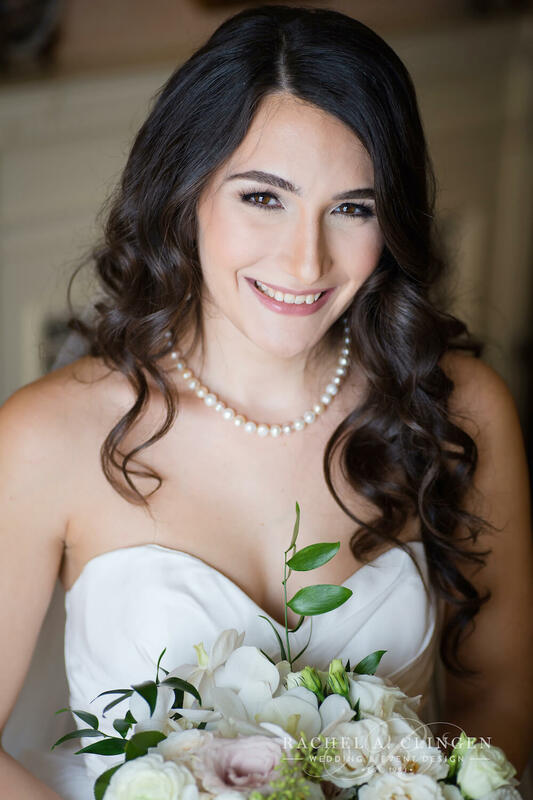 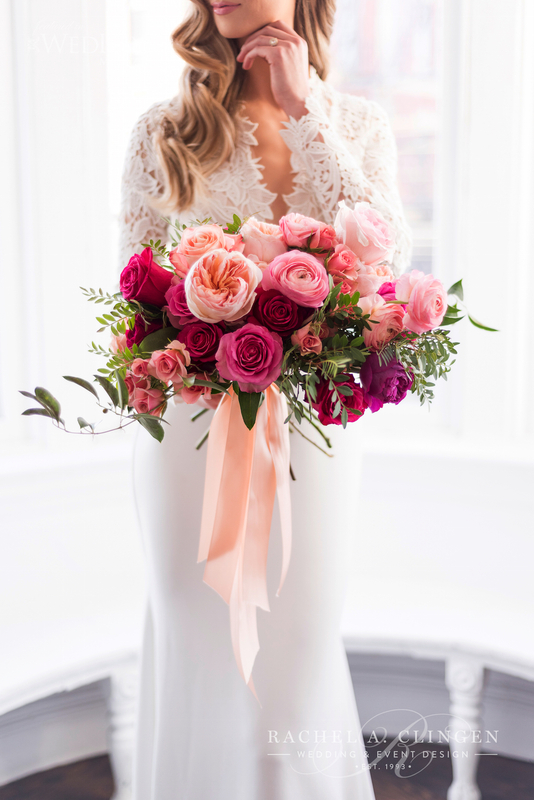 Alexa’s classic bouquet was created with cream ranunculus, white lisianthus, ivory spray roses and soft blush accent roses. 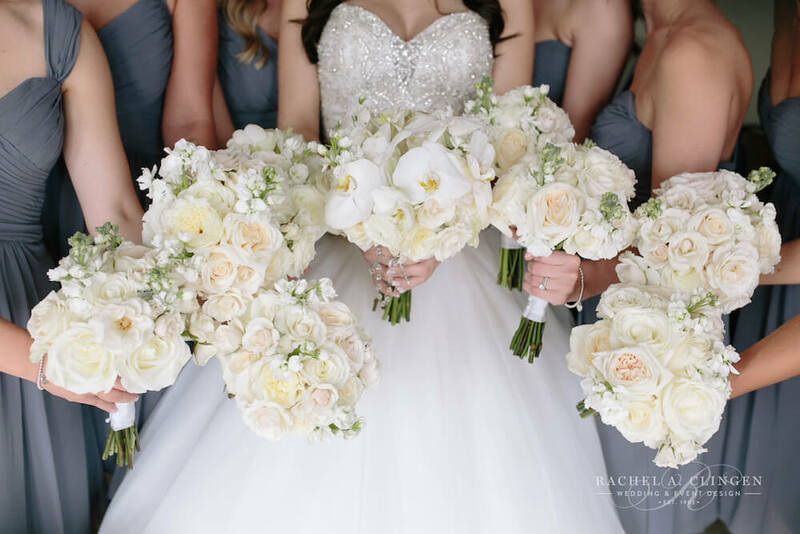 Accents of foliage gave the bouquet an organic feel. 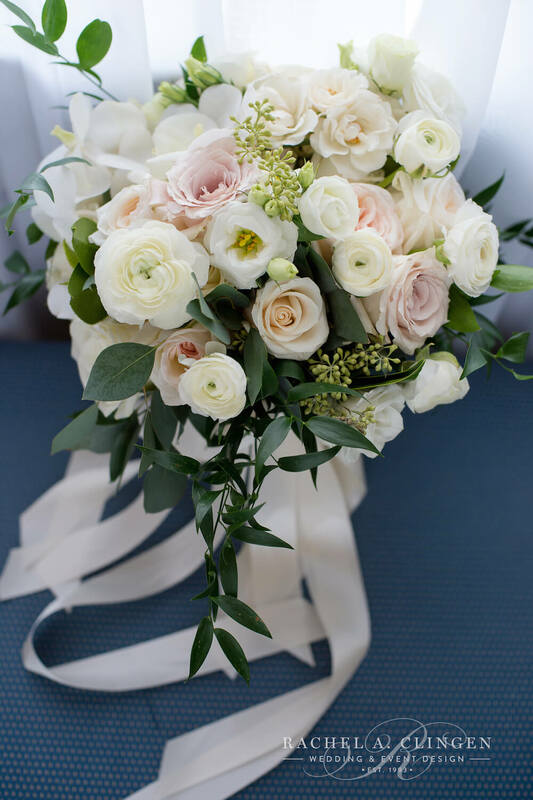 The bouquet was hand tied with ivory satin ribbons. 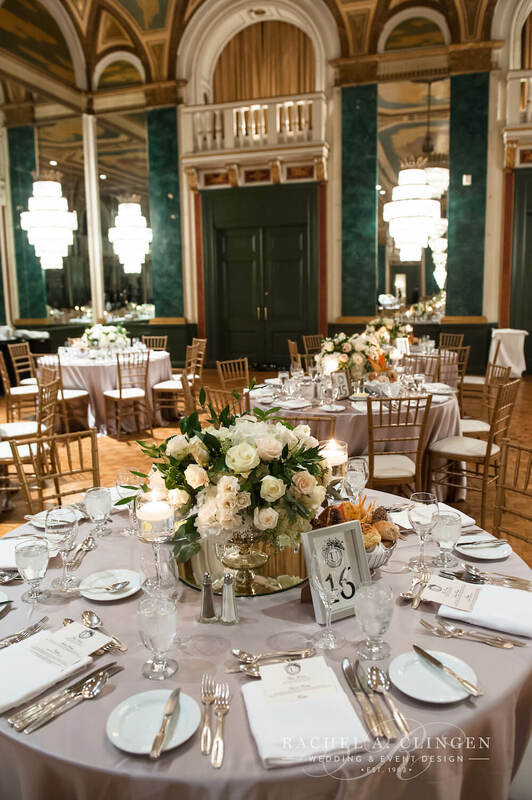 The ballroom at the Royal York Hotel was beautifully set up for Alexa and Jon Michaels wedding ceremony. 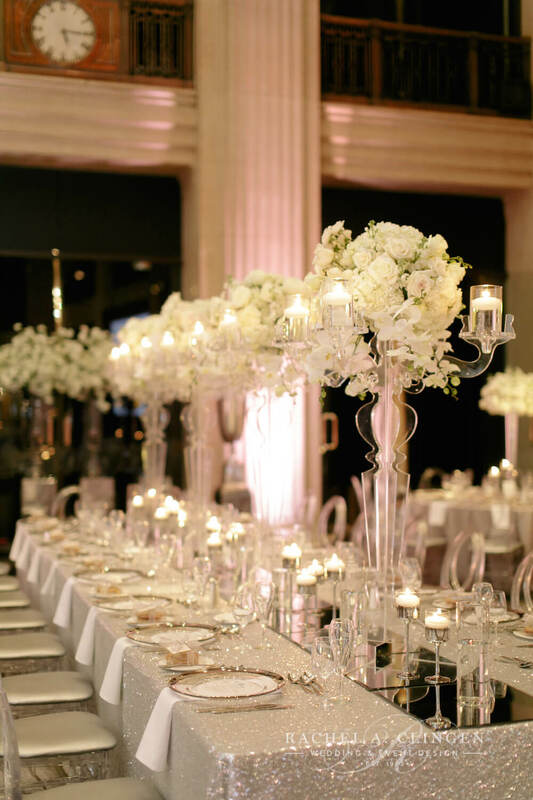 We designed the space with candle light and classic flower arrangements. 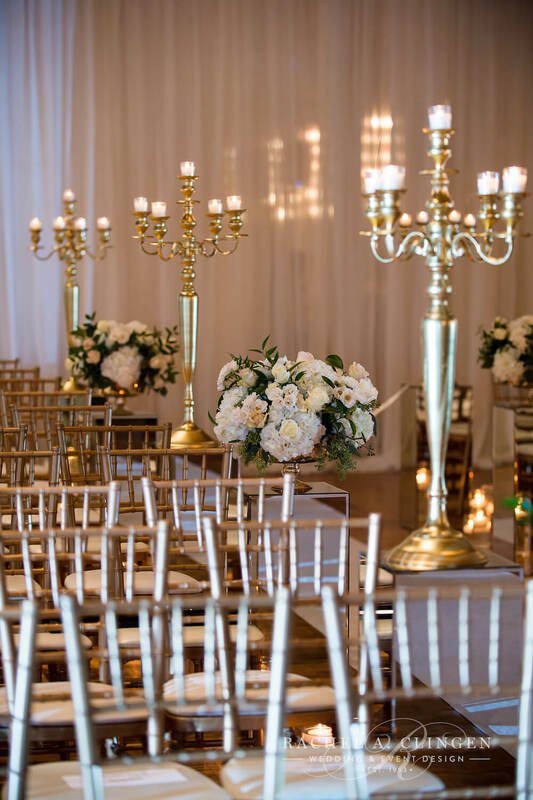 Our mirrored stands lined the aisle and were detailed with fresh floral arrangements and tall candelabras. 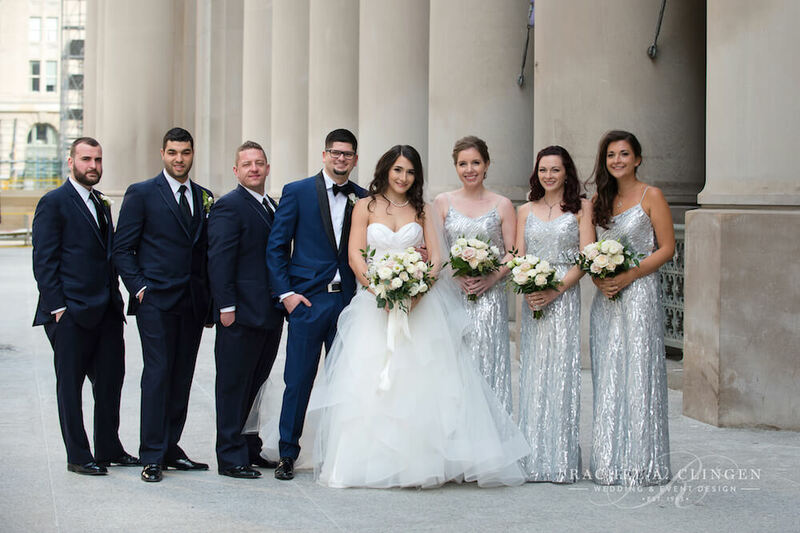 Low groupings of pillars candles accented the space and created a magical entrance way for Alexa and her bridesmaids. 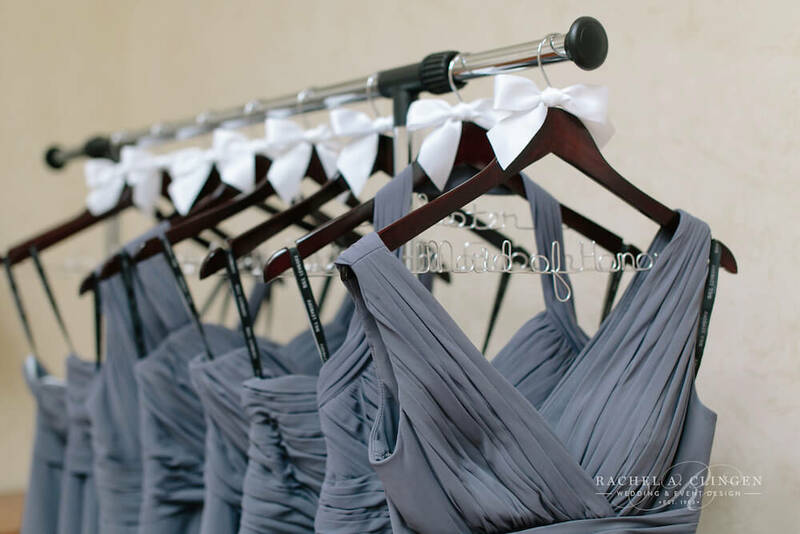 Mean-while preparations were being made behind the draped wall for the reception to follow. 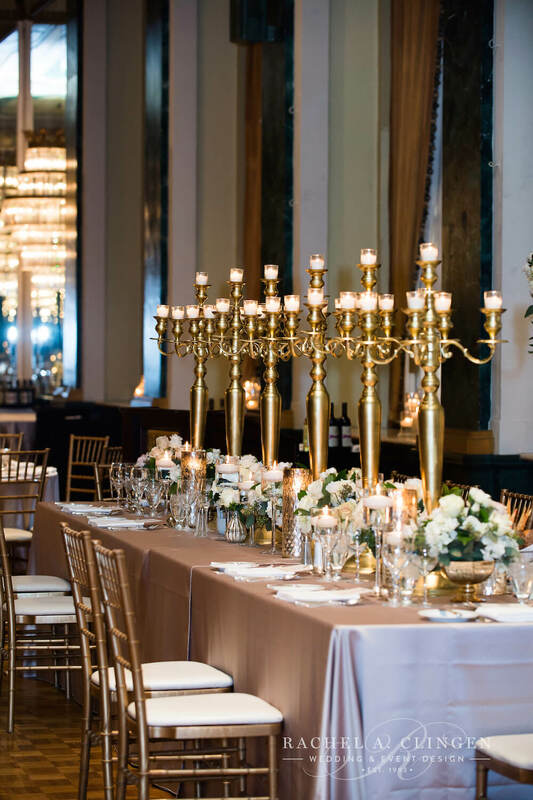 Later our team would flip the room and re-set for the reception. 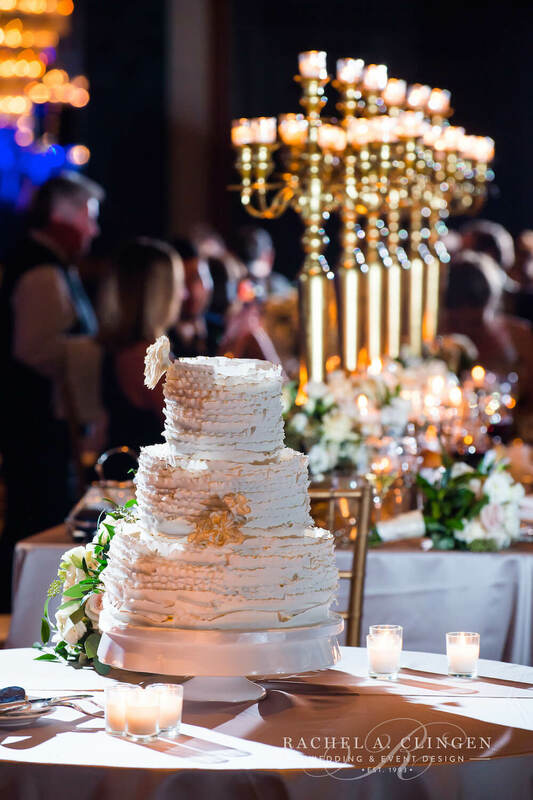 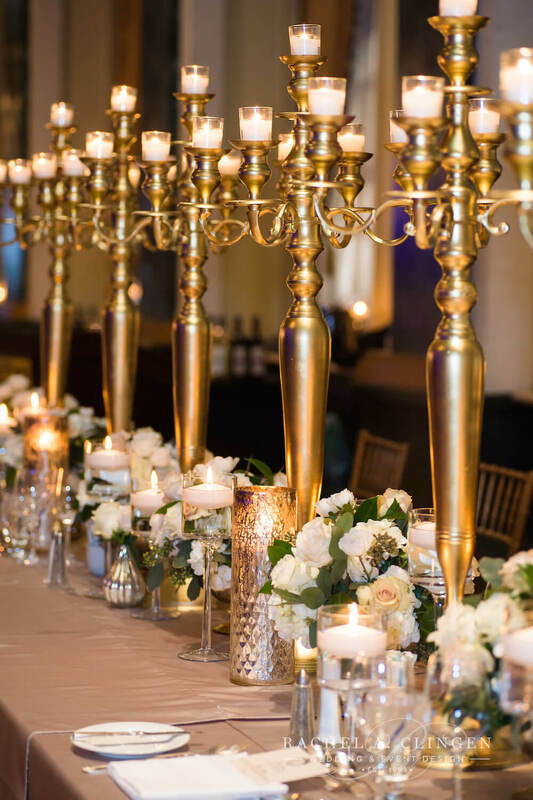 Since, the head table was lined with towering gold candelabras, low florals and glowed with groupings of candles to add a floral element. 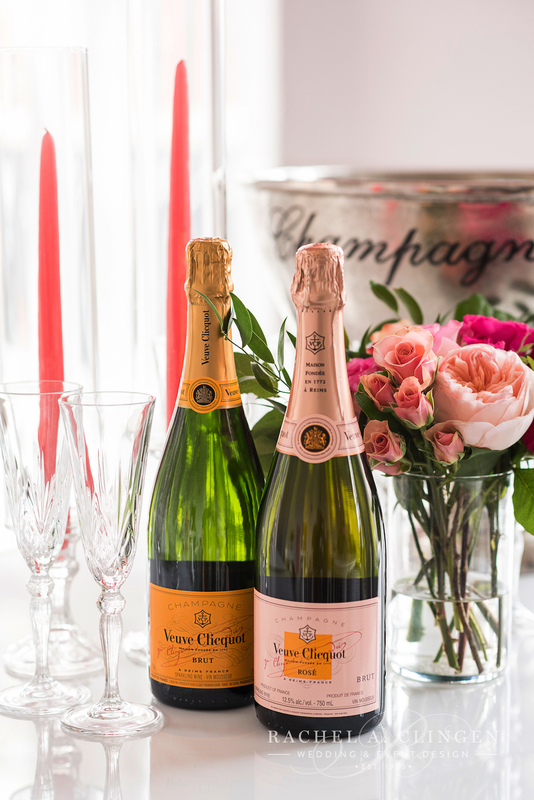 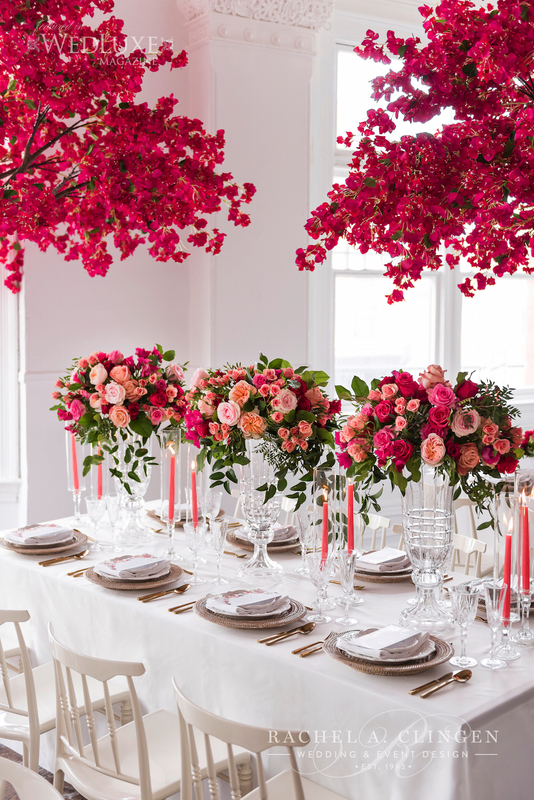 In addition to the head table, low centrepieces graced the guest tables. 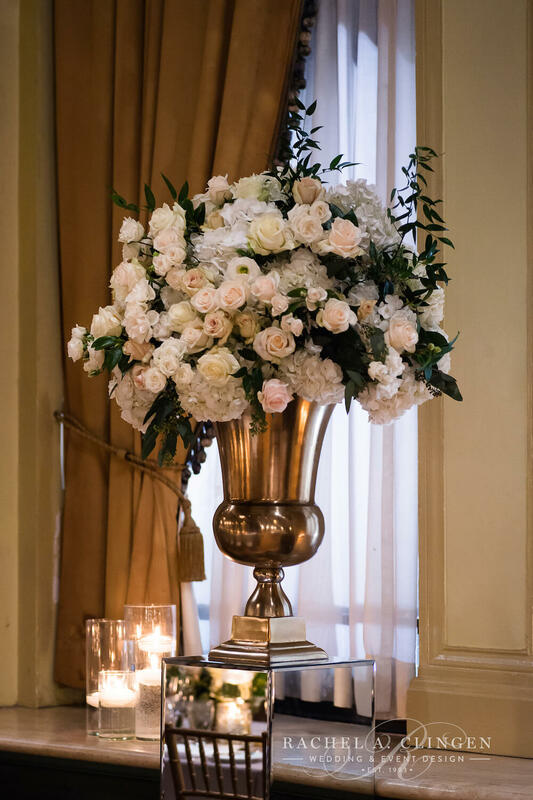 These were large and detailed flower arrangements in vintage gold mercury vessels. 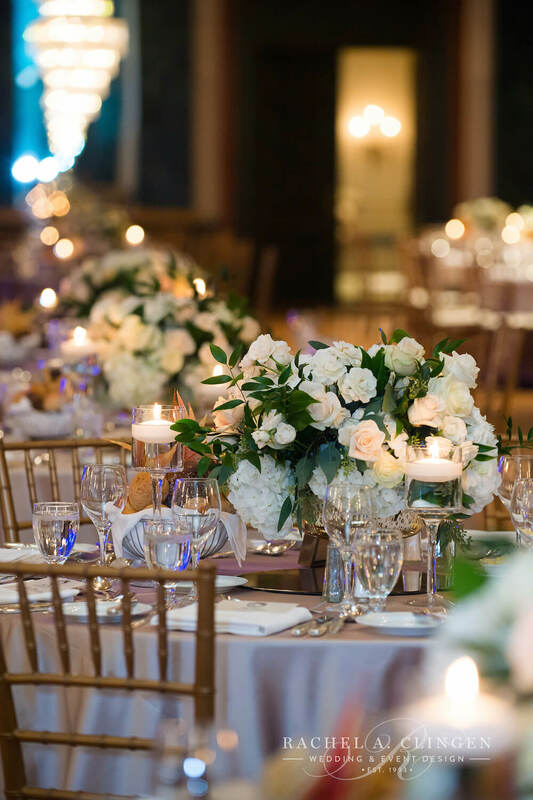 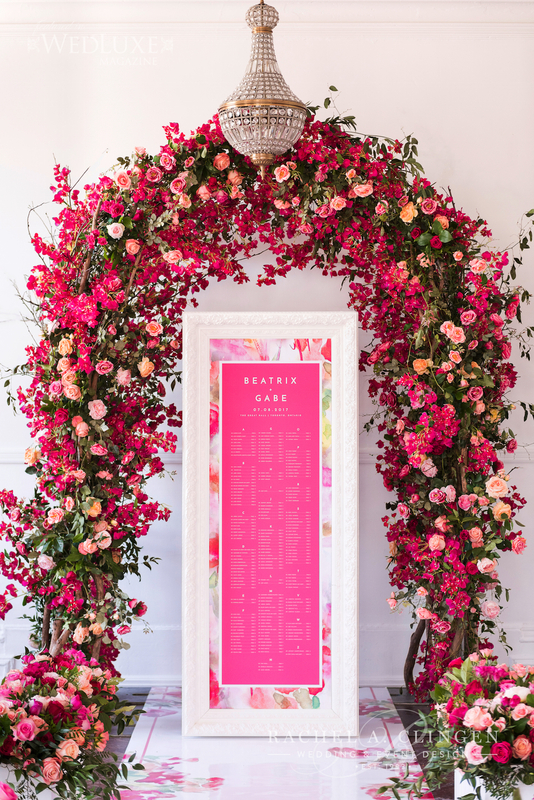 Flower collections included ivory garden roses, white lisianthus, cream hydrangeas and mixed foliage showcasing a beautiful display for family and friends. 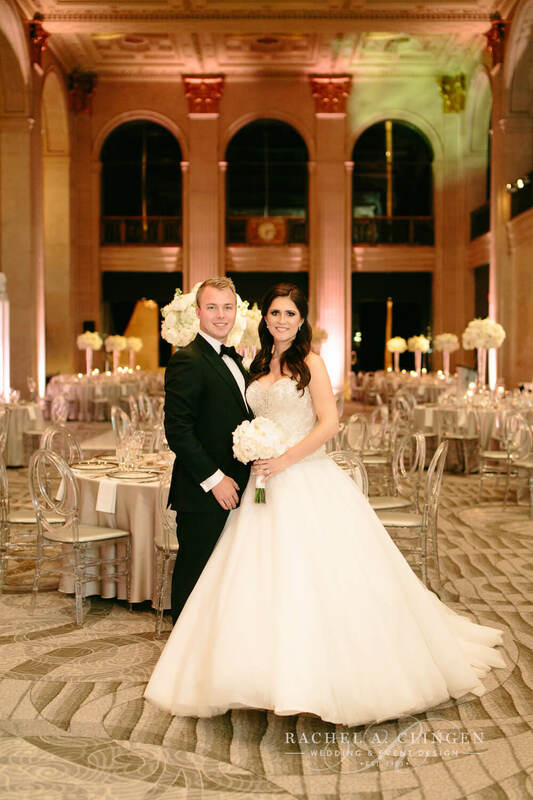 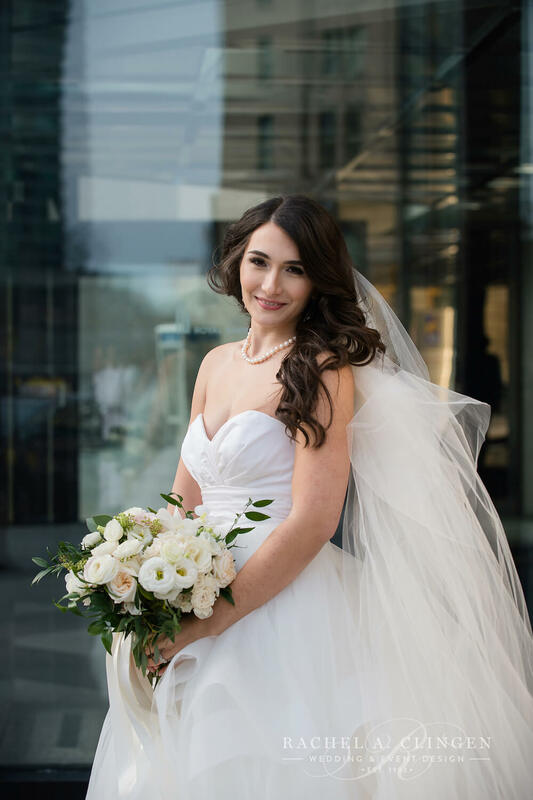 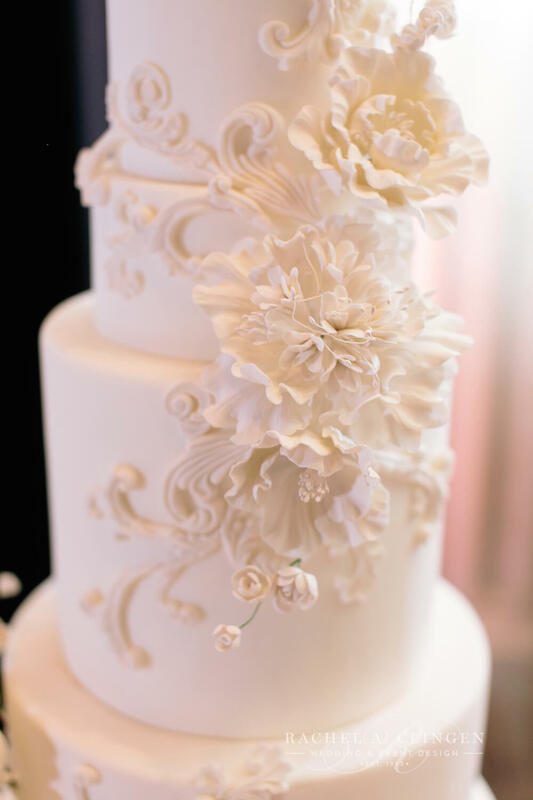 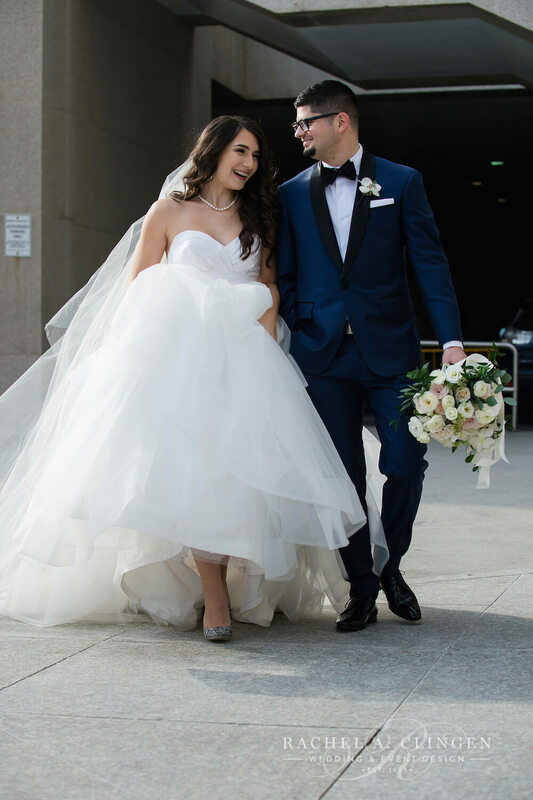 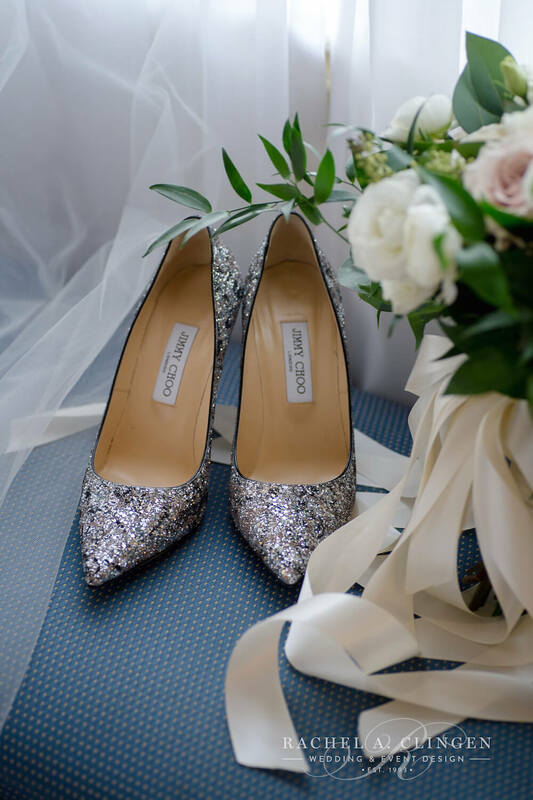 Denise and Chris celebrated their special day with a beautiful reception at One King West in Toronto designed with both modern and classic flowers and decor. 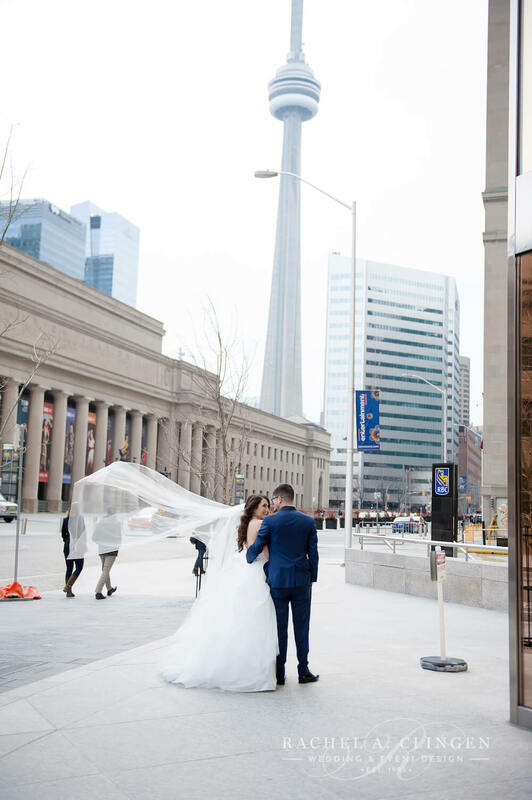 Embracing the nostalgia of this iconic Toronto Event venue we created a display of beauty displaying both classic and modern elements. 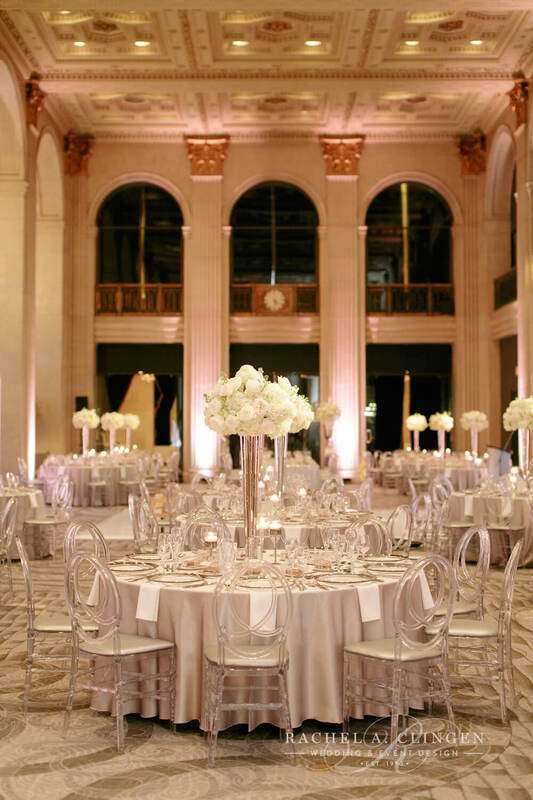 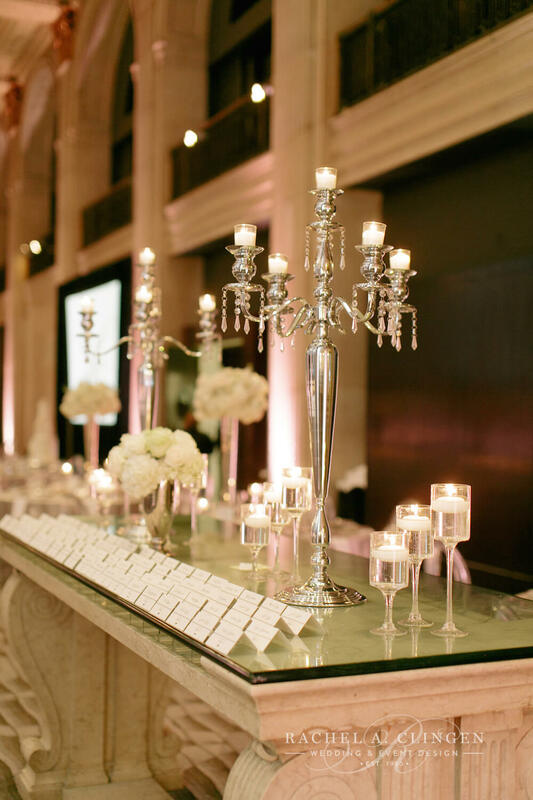 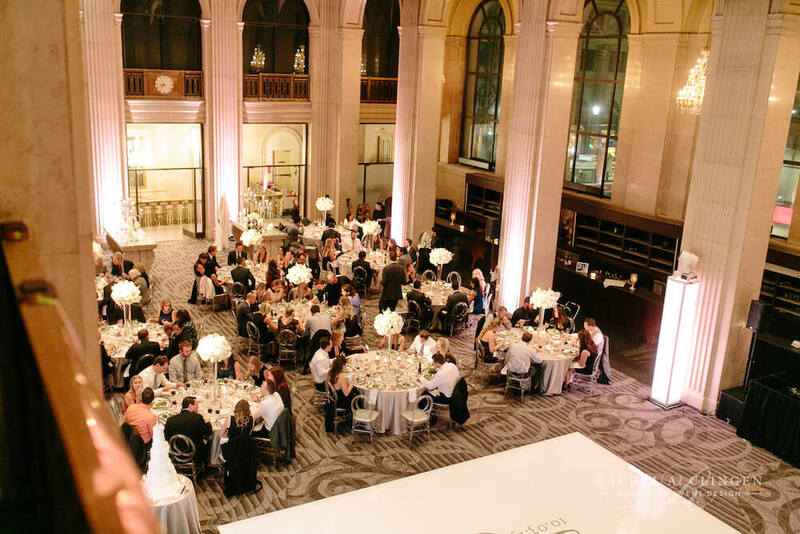 Our towering modern lucite candelabras were topped with white oversized flower arrangements paired with low rows of stemmed candle light created and un-forgettable feast for the eyes in the Bankers Hall at One King West. 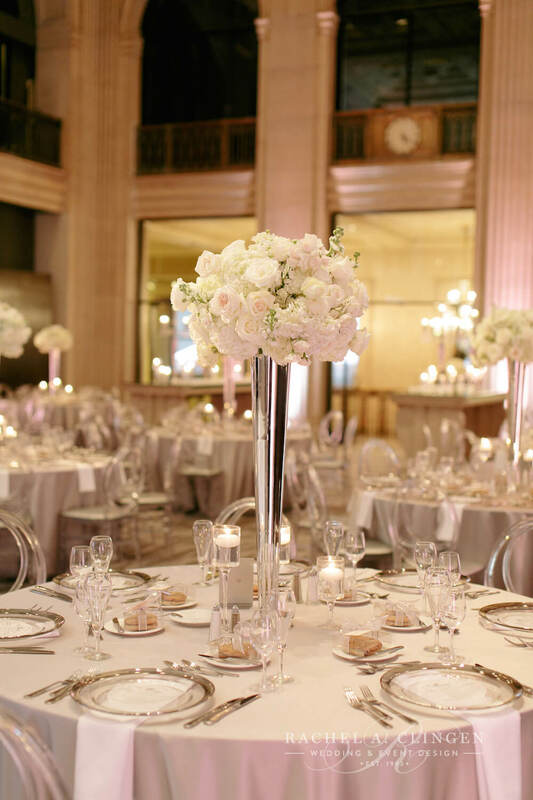 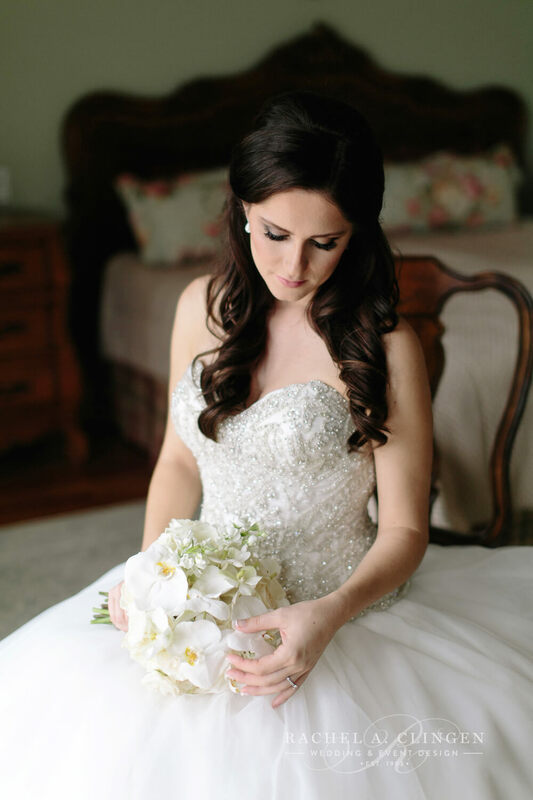 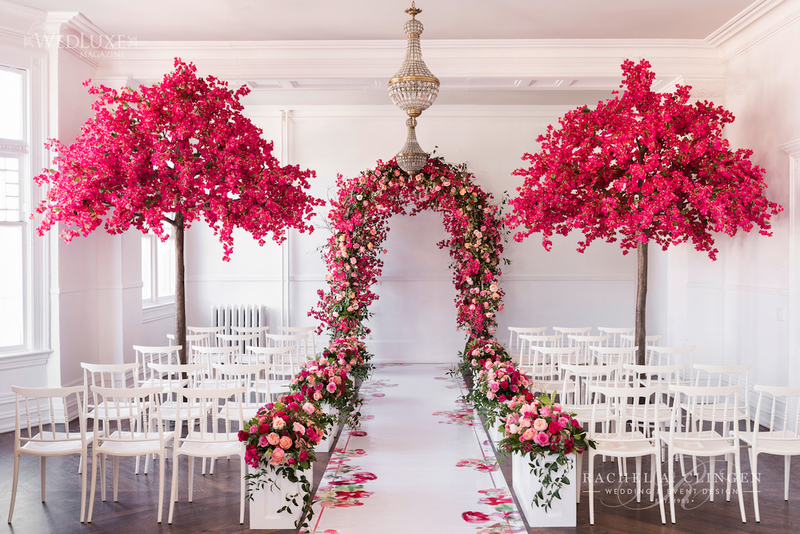 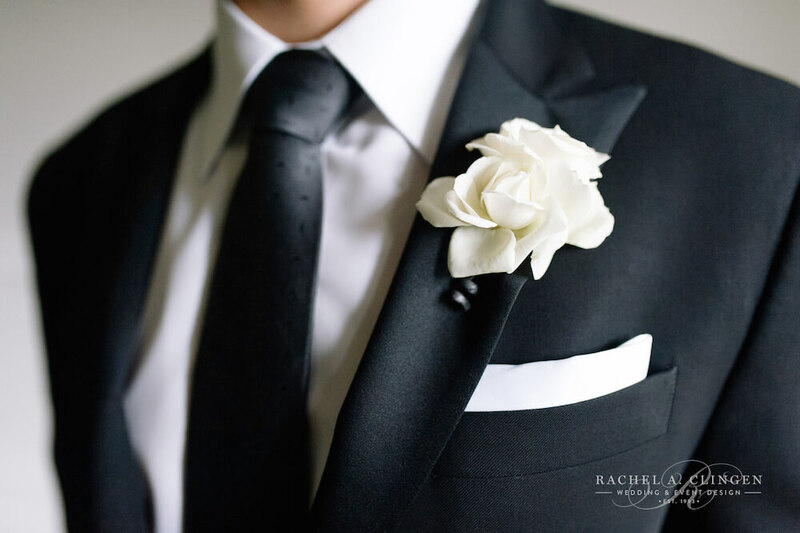 Each flower arrangement was accented with luxurious phalaenopsis orchids and white garden roses. 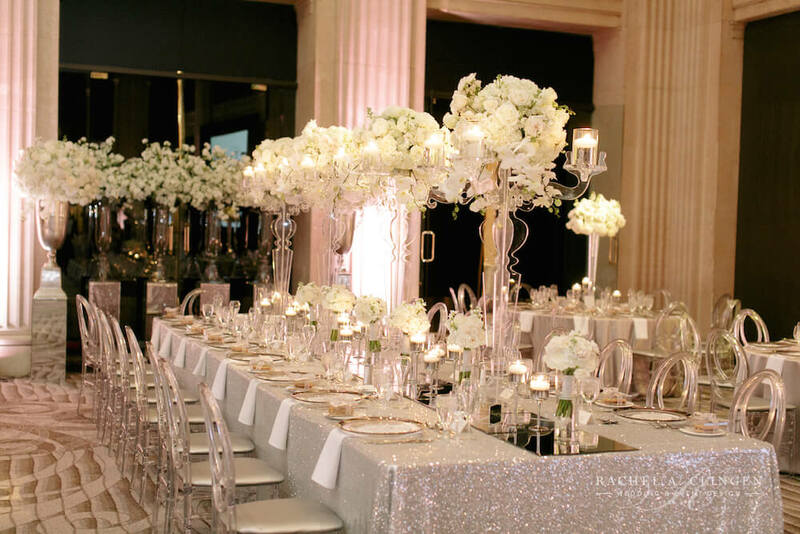 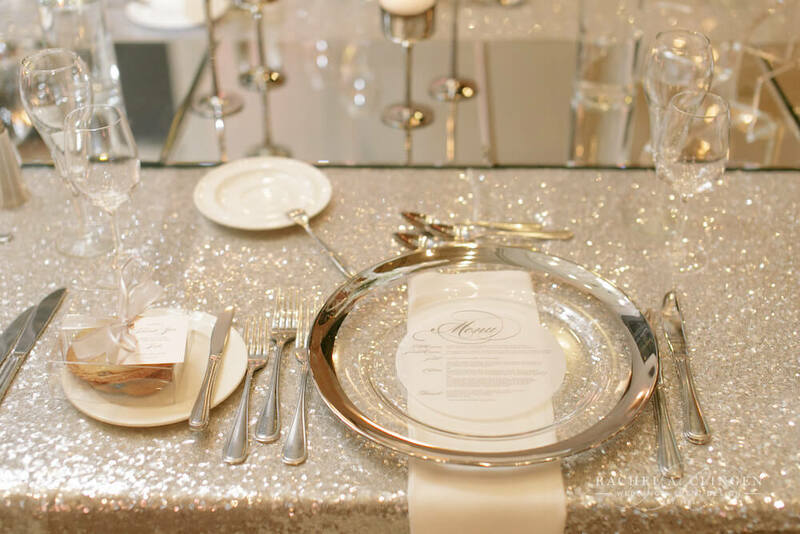 Each table sparkled with sequinned table linens and candle light at various heights. 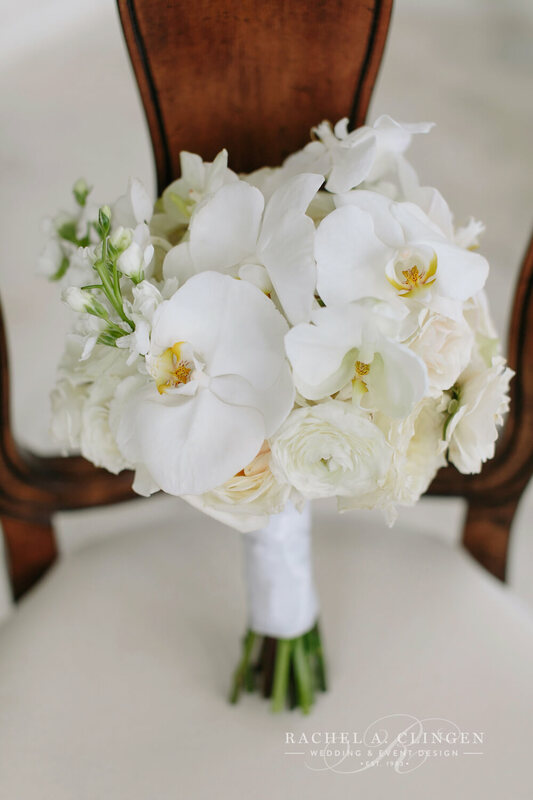 Denise and her bridesmaids carried hand tied arrangements of garden roses, ranunculus and phalaenopsis orchids. 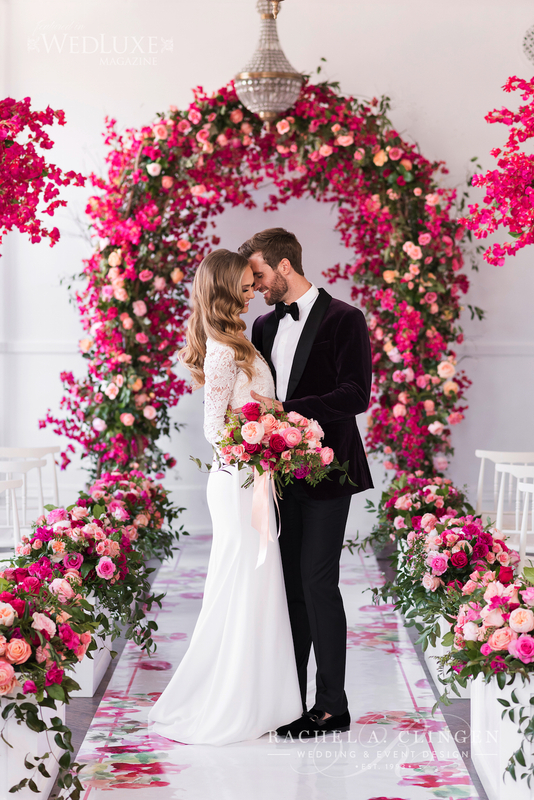 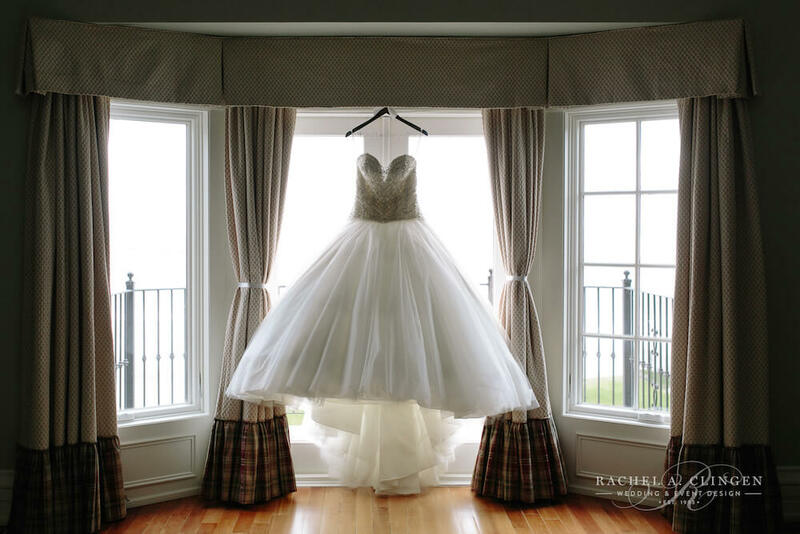 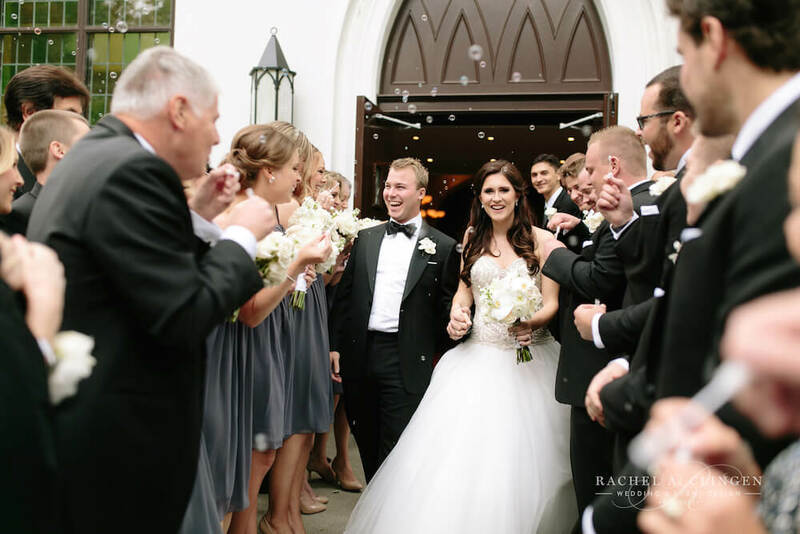 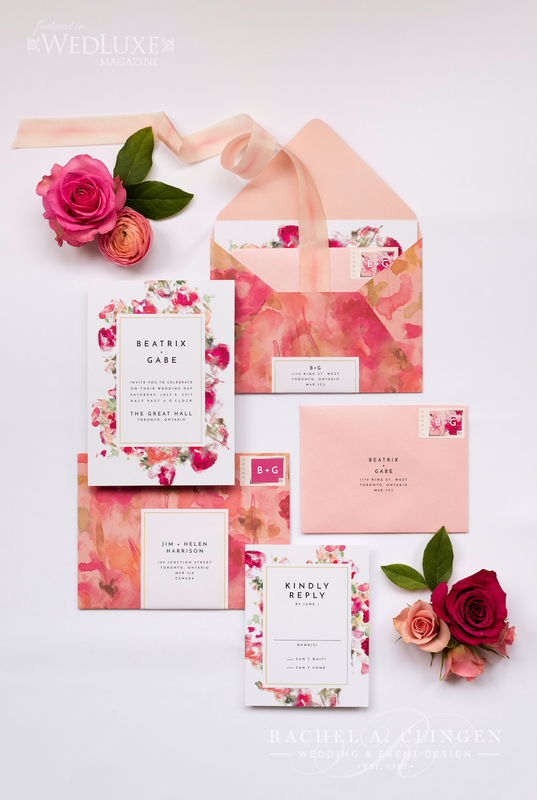 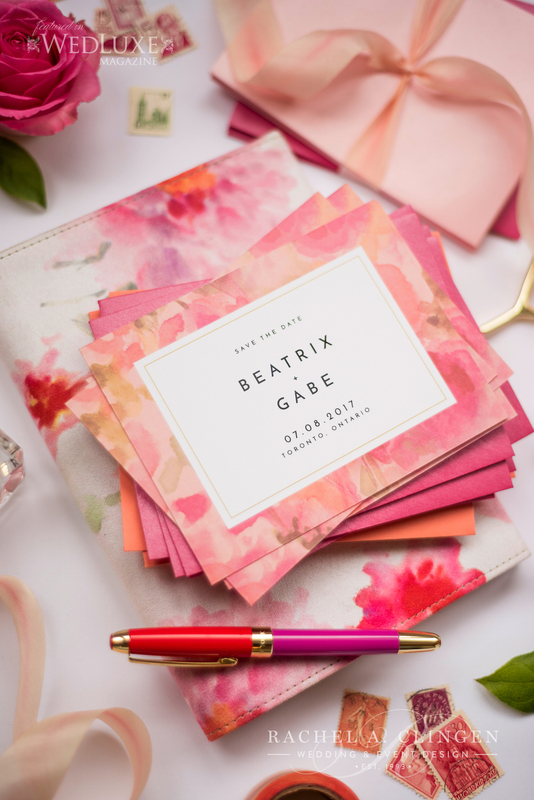 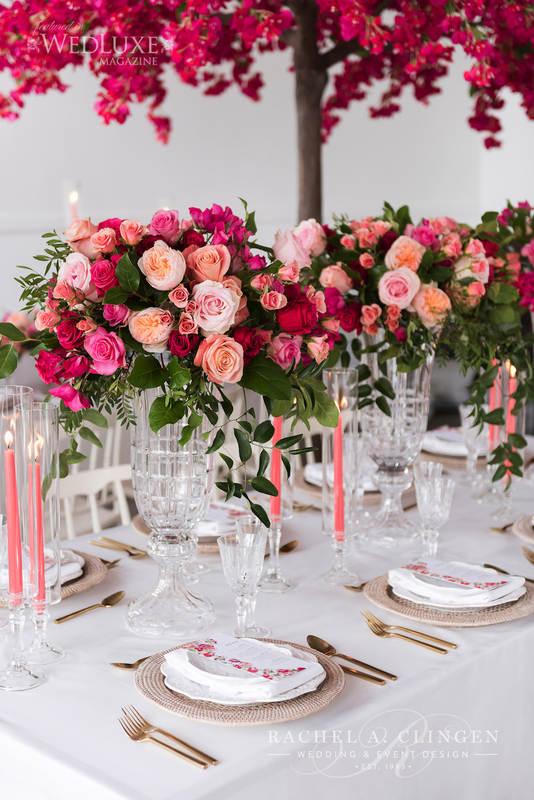 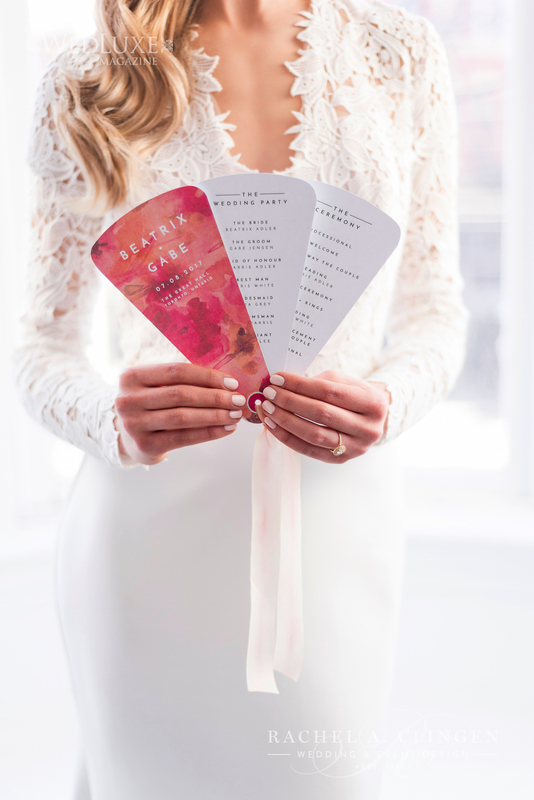 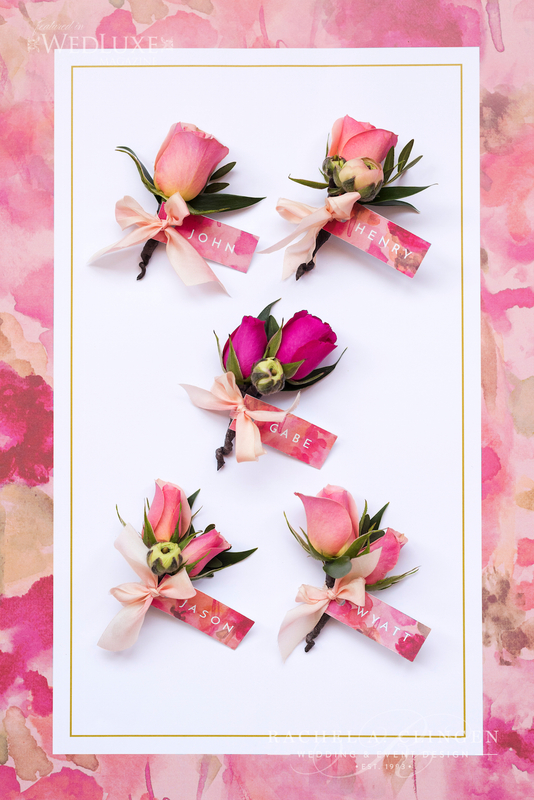 Wonderful to work on this one, with the amazing wedding planner, Laura from Laura & Co. Events and Mango Studios who always capture our events with perfection. 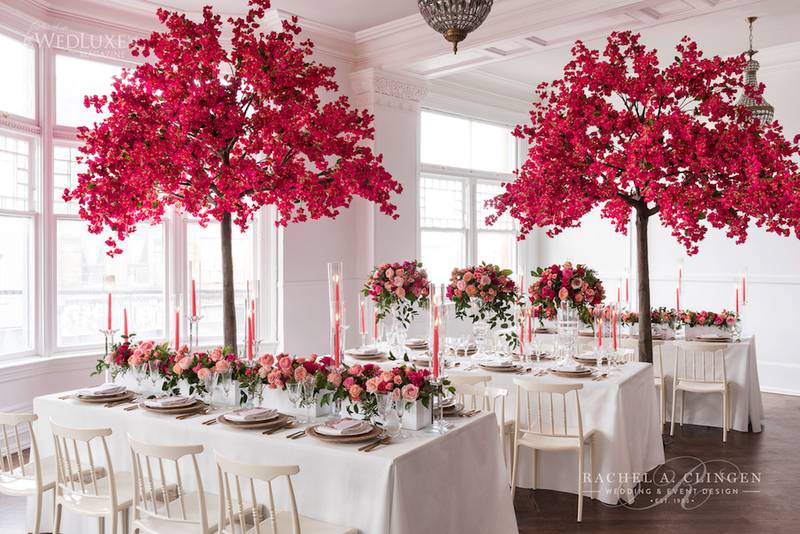 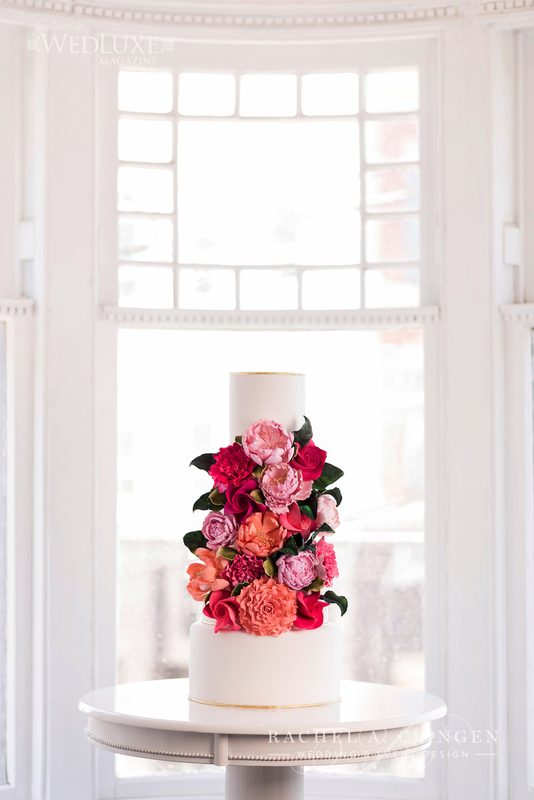 For always stylish wedding flowers and decor, visit us at www.rachelaclingen.com.